As people age, the nucleus pulposus may naturally dehydrate. Like a tire that loses air, its ability to absorb shock is lessened. The annulus fibrosus weakens and begins to tear. This may not cause pain in some people. In others, it may cause chronic pain, known as axial pain or disc space pain. Gradual dehydration of the nucleus pulposus is called degenerative disc disease. What is a Disc Hernia? Herniated discs can be called by many names. A slipped disc, ruptured disc, or a bulging disc can all refer to the same medical condition. Within the spine, a gel-like cushioned disc (nucleus pulposus) absorbs impact like a shock absorber. It is contained in a thick annulus fibrosus similar to an inner tube and an outer tire threads, and separates the vertebrae. When the annulus fibrosus tears due to an injury or the aging process, the nucleus pulposus can extrude through the tear. You might imagine a prolapsed disc as something like a doughnut with jelly. Applying pressure forces the nucleus pulposus to squeeze outside of the disc. This can put pressure on nerves and stimulate the symptoms of sciatica, or disc herniation. Like a tree branching out, major spinal nerves extend out all along the spine to various organs, tissues, and extremities. Herniated discs often press against these nerves. These ‘pinched nerves’ cause radiating pain, numbness, tingling, and diminished strength, and/or range of motion. Further, when the nerve comes into contact with the inner nuclear gel’s inflammatory proteins a person may experience significant pain. Nerve-related pain is also known as radicular pain. When the disc material protrudes into surrounding vertebrae it is called Schmorl’s nodes and is usually of no significance clinically. Sudden pain in your lower back or hip that radiates to the back of your thigh and down your leg. This may indicate a protruding (herniated) disc pressing on your sciatic nerve. If it feels like a bad leg cramp that lasts for weeks, it could be your sciatica. You may have pain when you sit, sneeze, or cough. Feeling numb, weak, burning or tingling, or a pins-and-needles sensation down your leg are also tell-tale signs. 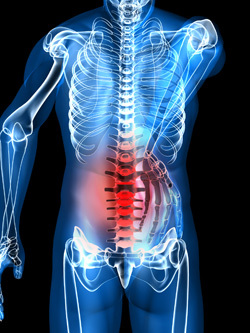 You are more likely to get sciatica if you are 30 to 50 years old. It may result from general wear and tear, or sudden pressure on the discs that cushions the bones (vertebrae) of your lower spine. In rare cases, a herniated disc may press on nerves that cause you to lose control of your bladder or bowel. You may also have numbness or tingling in your groin or genital area. This is an emergency situation that requires surgery. Phone your doctor immediately.